The musket rapidly the dominant infantry arm during the English Civil War. Musketeers could march faster than a heavily armoured Pikeman, were easier to train and of course the musket could kill or maim the enemy from up to 300 paces away. For the pike to do a similar injury it would have to be driven into the enemy in a fierce hand to hand melee. 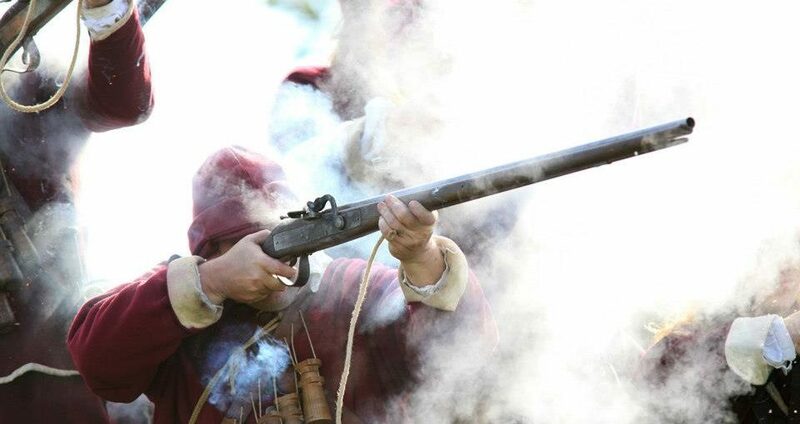 The musket has a rate of fire between 2 or 3 shots a minute, this is because it loaded via the muzzle and thus it takes time to prime the pan load the powder, ball and wadding down the barrel for each shot. There is a particular order for these loading actions and musketeers were trained to load the musket in a safe and timely manner. Forgetting to load powder or failing to take the scouring stick out would make the musket useless for the remainder of the battle. Musketeers had a bandolier of 10-14 wooden flasks each containing 1 charge of powder, or a beltbag of charges or “cartridges”, which are paper tubes filled with one charge. To use these cartridges you would bite off the end of the tube, pour the powder down the barrel then load the ball and use the cartridge now without powder as wadding to hold the contents of the barrel in place. Firing of the musket was achieved by using a piece of “match” this is cord soaked in saltpeter and then dried. This allows the match to burn slow and hot enough to ignite the powder in the pan. Musketeers were issued with a short sword, known as a tuck. This weapon was mass-produced and very inferior in quality; the blades were scarcely able to hold an edge. To use the sword this division of men, standing shoulder to shoulder must have broken ranks, rendering them ineffectual as a fighting unit. Further, their poor quality and short length meant that they were ineffective against any form of armour even a buff coat. Therefore the weapons tended to be used more for domestic purposes, such as chopping wood for a campfire. Musketeers are an important part of all our displays, both on and off the battlefield. When in a living history display, our musketeers explain the weapon and its history to the public or represent the sorts of activities soldiers would have undertaken in camp in the period, from gambling to guard duty. When on the field, musketeers with the appropriate certificates load and fire the weapon according to period drill procedures. For those without, we hold a number of “dummy” muskets which, though authentic, are incapable of firing. Our musket block engages in ranged fire against enemy units, and occasionally goes to “club musket” and charges in to finish off the enemy at close quarters. Overall, a great role with plenty to do both on and off the field.